The first tenants have been welcomed to Maes y Dderwen, the new £10 million extra care housing scheme for older people in Wrexham. 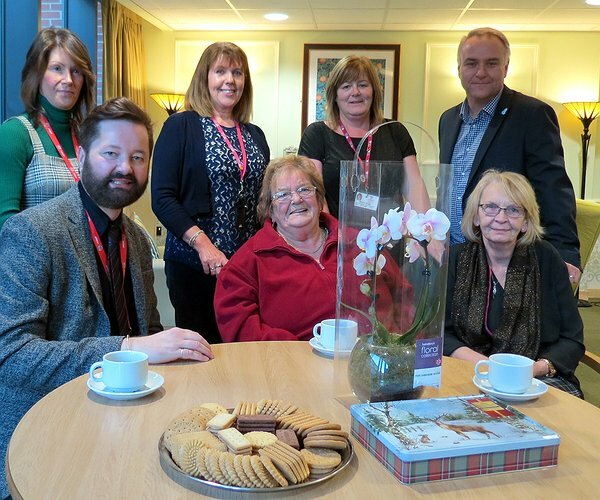 Mrs June Harry, aged 78 was among the first to move to the scheme when it opened last week and was welcomed by representatives from both Wrexham County Borough Council and the Pennaf Housing Group. “I feel settled and at home here already. I’m a Rhosddu girl originally and I think this is a wonderful place. I’m really looking forward to getting to know other people here, being able to socialise and make new friends. “One of the real advantages is that you have all your own independence and privacy, living in your own home, so you can choose to be as private or as sociable as you like. I think there should be more places like this”, Mrs Harry added. A phased move-in period has been arranged to minimize disruption for new tenants, who each have their own self-contained apartment as well as access to a wide range of communal facilities and, for those tenants who require it, access to 24-hour support. The scheme is owned by Clwyd Alyn Housing Association, part of the Pennaf Housing Group, and managed in partnership with the Local Authority. Councillor Joan Lowe, Lead Cabinet Member for People – Adult Social Care for Wrexham County Borough Council said: “This exciting new extra care scheme is an integral part of the innovative range of housing options for older people that we are helping to provide across the County. “Maes y Dderwen is in a superb central location in Grosvenor Road Wrexham and it is clear that the scheme will provide high quality accommodation for tenants, allowing individuals to maintain their independence, whilst also offering peace of mind that a dedicated care and support team is on hand to support people who have been assessed as requiring additional care and support." The scheme is specifically designed for people aged 60 and over with individual care support to meet a wide range of needs. Maes y Dderwen is a partnership development between Wrexham County Borough, the Welsh Government and Tŷ Glas Housing Society, part of the Pennaf Housing Group and is managed by Clwyd Alyn Housing Association, also part of the Pennaf Group, with individual domiciliary care provided by the Local Authority. The scheme was made possible thanks to Welsh Government Social Housing Grant (SHG) and Vibrant and Viable Places (VVP) funding secured in partnership with the Local Authority, together with private funding arranged by Pennaf. "New extra care tenants go back to school in style"